At least 360 people were rescued in New Bern on Friday. More than 24 hours after Florence caused major flooding in New Bern, N.C., the city announced that all people who needed rescuing had reached safety. "We have completed all of our water rescues & want to sincerely thank all of the volunteers who helped us save lives. You rock! We couldn't have done it without you!" the city tweeted on Saturday. When Florence hit as a Category 1 hurricane early Friday, the community's rivers swelled, tides crested and the rain wouldn't stop. And that's when people found themselves trapped in their homes as the water rose. At 2 a.m. Friday, the city tweeted an ominous message, saying at least 150 people were awaiting rescue. It was initially unclear how many people ended up being rescued. There were no immediate reports of injuries or fatalities, though most of the city was without power and thousands of buildings had been damaged, said Roberts on Friday. 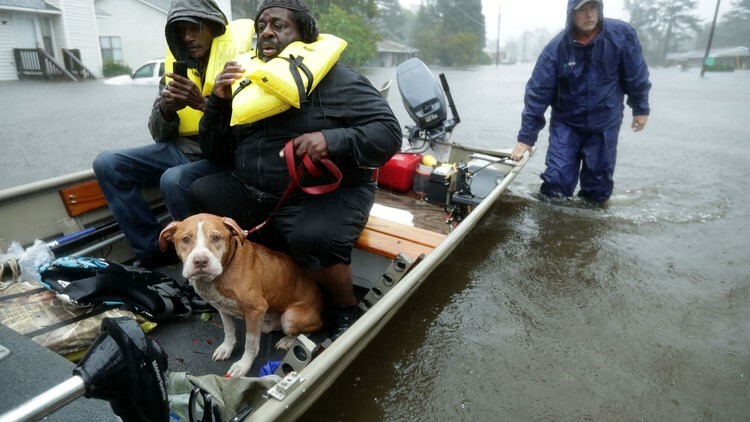 Volunteers from all over North Carolina help rescue residents and their pets from their flooded homes during Hurricane Florence September 14, 2018 in New Bern, United States. Roberts, the city spokeswoman, said Friday preliminary estimates show about 4,300 residences and 300 commercial buildings had been damaged. She said that count is expected to increase significantly. Associated Press writers Sarah Rankin in Richmond, Virginia; and Martha Waggoner in Raleigh, North Carolina, contributed to this report. Lush reported from Jacksonville, Florida. Contributing TEGNA Staff.